Most of us are familiar with the magazines and condensed books published by Reader’s Digest, but did you know they do cookbooks too? I’ve already cooked a page-32 recipe—brussels sprouts and chestnuts—from one of their books, which just happens to be one of the first cookbooks I ever bought. I bought today’s book several years ago for $1 at a local op (charity) shop but this is the first time I’ve cooked from it. It has almost 500 recipes covering almost all the ingredients you can think of. There’s even a chapter on cooking for one. Each recipe is comprehensive with easy instructions, time to make, number of serves and kilojoule/calorie count. Page 32 takes 30 minutes (15 minutes of that to chill) and has ingredients I love. 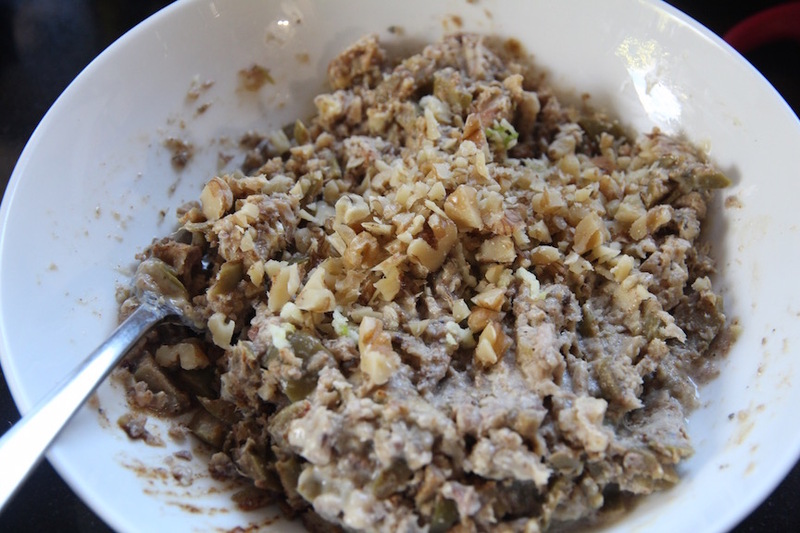 In a mixing bowl, mash the sardines with a fork, then blend in the butter to make a smooth paste. Add the lemon juices, olives, horseradish, garlic, mustard, paprika, black pepper, Worcestershire sauce and cayenne pepper and the walnuts if used. Blend well and taste the mixture for seasoning. Chill for 15 minutes. Serve as a spread for savoury biscuits or toast, or use as a stuffing for celery. Tips: You can make this spread ahead and refrigerate it for 1 or 2 days. Try this with a 100g can of tuna instead of the sardines. 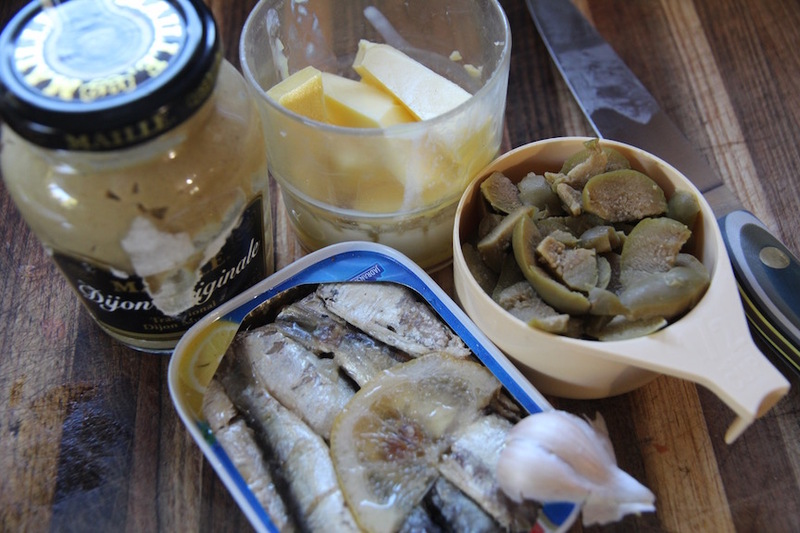 I made this mostly as written, using a 115g tin of sardines, butter and largish green olives because I didn’t have any stuffed ones. 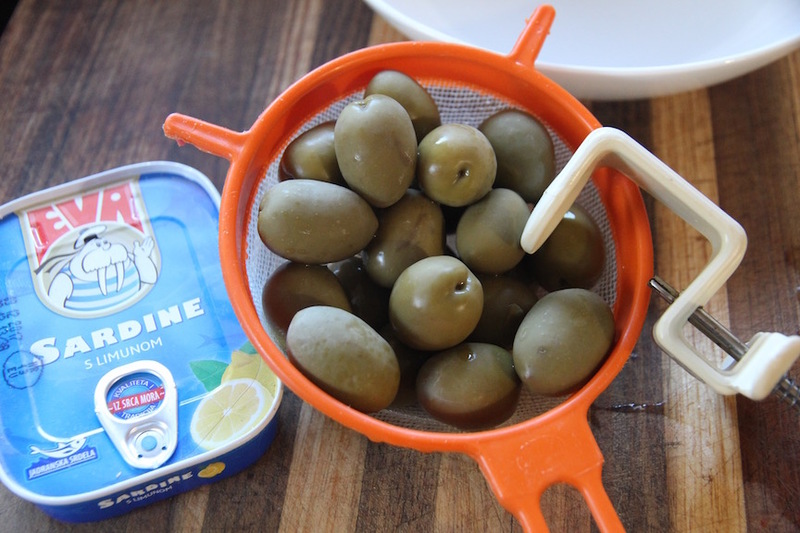 Sadly, my olive pitter wasn’t up to the task, so I had to use a knife. Took a little longer, but still did the job. We’re nut lovers so of course I added the walnuts. Oh, and the finished recipe didn’t need salt. A real winner and so easy to make. I shared some with my friend, Maggie. A few hours later she called to say another friend, Louise, had stopped by and loved it so much she had to have the recipe ASAP. So here it is. P.S. 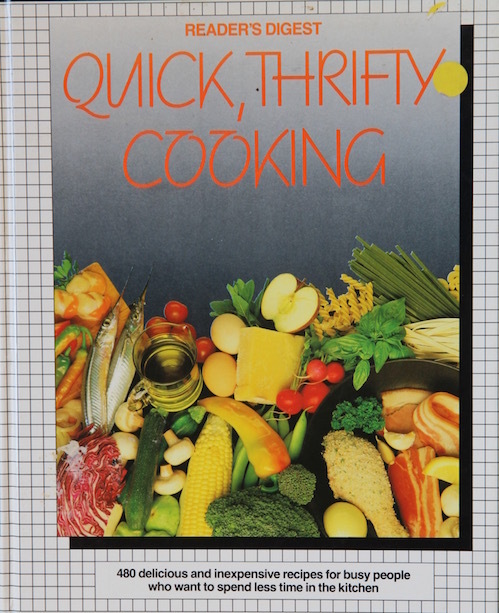 I’ve been thumbing through this book and it really is loaded with tempting recipes. If you have a moment, I’d love it if you would check out my travel blog. P.S. My friend, Sy, in New York has already made this recipe (using celery) and has kindly shared his photo with me. You can see his comment below. This entry was posted in Appetiser, Fish and seafood, Snack and tagged butter, cayenne, garlic, horseradish, lemon juice, mustard, olives, paprika, sardines, walnuts, worcestershire sauce. Bookmark the permalink. Apparently, you made a very good find for so little money. First time I read a recipe for this pâté. It is not usual to use the sardine like that. A good weekend. Thanks so much. It really is a delicious way to use sardines. This is really easy and sounds very tasty. Thanks Peggy. I too am a sucker for anything with fish. The sardines are always a steady standby. Did I tell you we once taped a sardine under teacher’s desk at school? It pays to get better quality sardines. And then the deep frying of butterflied fresh sardines. I could go on. You’re in luck. I have a page-32 recipe coming up for fresh sardines. Haven’t made it yet, but it’s on the list. Stay tuned. That’s a very interesting list of ingredients, Peggy. Sardines and horseradish, olives and worcestershire sauce sounds like an unusual mix. One would have thought some of the favours would clash or overpower each other? Or maybe it’s like a good Curry (from any country) – the long list of ingredients are combined to make a wonderful taste. You’re right Vicki. It is a long list of ingredients, but they work very well together. Sounds like an interesting recipe. I like sardines though I’m not sure they’re really popular in the U.S. so I appreciate that you suggested tuna as a substitute. But I don’t think I’d use butter – mayo or olive oil sounds like a better choice to me. Otherwise, it does seem like it’s delicious. Mayo would be a great substitute for the butter. Olive oil might make it too runny. Thanks for stopping by, Sid. I hope your hubby likes this. Hope you have a wonderful weekend too. I enjoyed your past recipe “Sardines on Toast” (https://cookingonpage32.wordpress.com/2018/03/28/sardines-on-toast/), so I was looking forward to making this one. And being that it is extremely hot and humid here in NYC, not using the stove or oven made this Sardine Pate recipe an easy choice for a lunch snack. Plus I had all the ingredients already, and decided to use celery sticks stuffed with the Sardine Pate ingredients. Plus I am allergic to walnuts so used peanuts and yes I did use butter (but accustomed to using Mayonnaise). Finally I decided to also use a Blue Cheese dipping sauce as well. Verdict, a nice tasty recipe. You are quick. I barely hit publish and you have already made the recipe. Glad you tried it with celery sticks. I would have done that, but didn’t have any celery on hand. Thanks for the pic too. I’ve added it to the post.